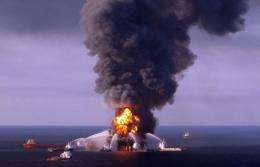 A US Coast Guard handout image shows fire boat response crews battling the blaze at the BP-operated Deepwater Horizon oil rig in the Gulf of Mexico in April, 2010. The crew of the facility that exploded last year causing one of the worst oil spills in US history ignored warning signs a disaster was imminent, an investigator has said. The crew of an oil rig that exploded in the Gulf of Mexico last year causing one of the worst oil spills in US history ignored warning signs a disaster was imminent, an investigator said Friday. Marshall Islands deputy maritime affairs commissioner Bill Gallagher, who carried out an inquiry into the explosion because the rig was registered in the Pacific nation, said lessons had to be learned from the disaster. He said there were indications of a problem at the Deepwater Horizon rig before the blast that killed 11 people on April 20 last year but the crew failed to act. "There were multiple signs that there were issues at the well itself, indicators, pressure testing, things of that nature were going on," Gallagher told Australia's ABC radio Friday. "There were signs that there were some problems with the well...the blow out started and then, of course, the disaster followed shortly thereafter." Gallagher, whose report into the incident was released on Wednesday, also cited "deviation" from drilling rig control engineering standards as a reason for the disaster. "These factors contributed to the substantial release of liquid and gaseous hydrocarbons, which culminated in explosions, fire, the loss of 11 lives, the eventual sinking and total loss of the Deepwater Horizon, and the release of hydrocarbons into the Gulf of Mexico," the report said. Almost five million barrels (210 million gallons) of oil spilled into the Gulf of Mexico after the rig's failure, causing enormous environmental damage. British oil giant BP last month estimated the total clean-up cost at $40.7 billion. Gallagher said his report did not attempt to determine who was responsible for the spill, an issue which is the subject of legal action in the US between BP and the rig's operator Transocean Offshore Deepwater Drilling. "It's not for us to assign blame," he said. A US Coast Guard report in April found Transocean had "serious safety management system failures and a poor safety culture", while a US presidential commission in January slammed "systemic" failures in oil industry safety practices. The commission called for an overhaul of industry safety measures and the establishment of a tough new safety watchdog to avoid a repeat of the disaster. Under maritime law, oil rigs such as the Deepwater Horizon are classified as ships, meaning they can be registered in jurisdictions such as the Marshall Islands and Panama. The Gallagher report said inspectors acting on hehalf of the Marshall Islands inspected the Deepwater Horizon in December 2009, four months before the accident, and found it met safety, security and environmental standards. "It's not for us to assign blame"
This sounds like politically correct "doublespeak." Bob (not his real name) works for the Laundry. A secret British Office to protect the world from the Elder Gods. For more information on Bob see Charles Stross's Laundry series.